I am so excited for today’s recipe! Today for the #SundaySupper we had to make either a Savory cheese, tasty cake, or a glorious cheesecake. Well I went with cheesecake!! My cheesecake may not be glorious but it sure makes me happy!!! I am so proud of these little guys! 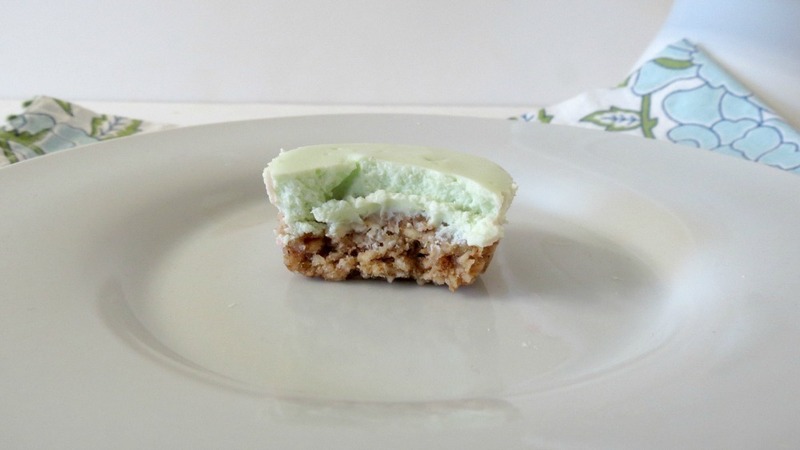 I went with mini lime cheesecake bites because I thought it would be perfect for a brunch, baby shower, Easter and St. Patrick’s Day! They are so cute and precious, not to mention very tasty. 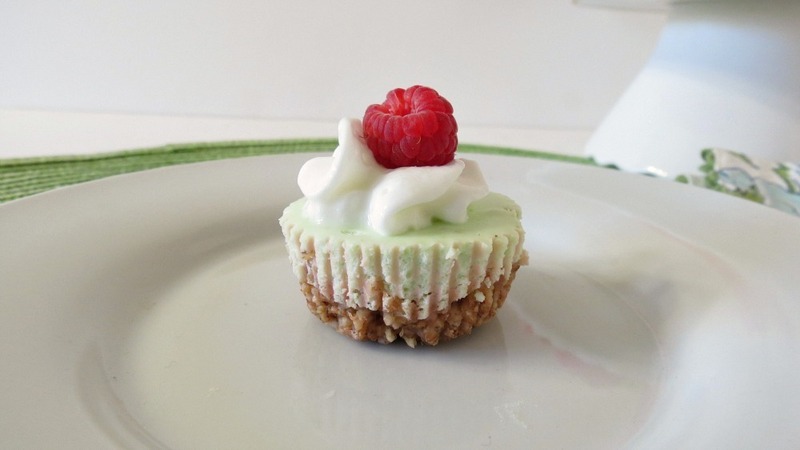 When making these cheesecakes, I used fresh limes, 1/3 less cream cheese and plain greek yogurt. Since I didn’t have graham crackers for the base, I decided to make my own base by using ground oats, regular oats, cinnamon, maple syrup and applesauce. It all came together so nicely, and the flavors of the lime is simply refreshing and perfect. With a little bite, it leaves a nice little zing but to much. Not enough to leave you zippy’s in your mouth. You know the feeling I’m talking about, the kind where you eat some sour and you get that funny feeling in your throat. I call that zippy’s! 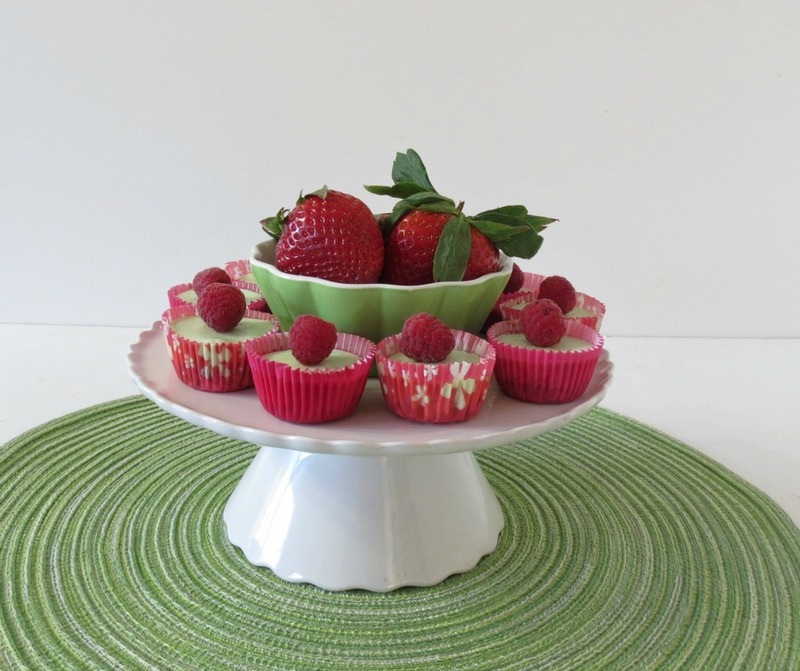 For serving I used the pink muffin liners because I love the color of pink and green together. To serve I would serve these with a dollop of whip cream and a little raspberry. I think the raspberry compliments the lime very well. Plus the colors go so good together. 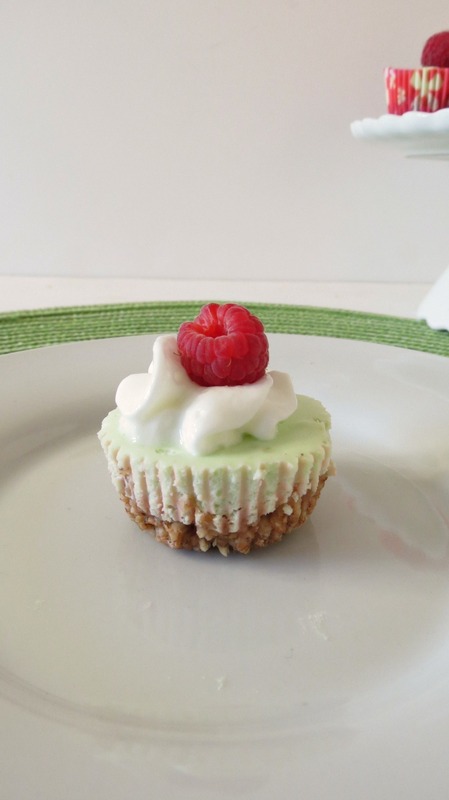 Tangy and creamy freshly squeezed lime cheesecake sitting on a cinnamon oat crust. Base: In a bowl add oat flour,oats, baking powder, cinnamon and salt into large bowl, Stir until combined. Add in the applesauce, maple syrup and vanilla; mix well. Scoop about 1 heaping teaspoon of batter evenly into each muffin cup and push down firmly with fingers to smooth out. I found that wetting your fingers makes the base not stick to them. Topping: In a small bowl add cream cheese and sugar; beat until creamy. Add vanilla extract, egg and salt; beat until combined. Beat in yogurt and lime juice; until creamy. Fold in lime zest. Evenly pour cheesecake batter into muffin cups. NOTE: You will have leftover batter. Bake, rotating pans halfway through, until filling is set, 15 minutes. Let cool on a wire rack. Chill in the refrigerator for at least 4 hours, or up to overnight, before serving. Calories will be a less then what I give you, as I had a pinch of crust base left over and enough cheesecake batter to make 3 standard muffin cups without base. So you don't waste the batter, I filled 3 standard muffin pans with batter and cooked the same way as mentioned in the recipe, but cooked the cheesecakes for 20 minutes. As I mentioned in my recipe, the calories are less than what I put in the recipe. I had enough batter to make 3 standard size muffin cup cheesecakes. You can do the same, the cheesecake is fine with out the base. My guess is the cheesecakes are about 36 – 40 calories each! Not to shabby for cheesecake. I really had fun with today’s #SundaySupper. I can’t wait to see all the savor cheese dishes and cheesecake recipes! Make sure you check them out too! Dense Chocolate Cherry Cake by What Smells So Good? Chocolate Cheesecake Bites by Mom, What’s For Dinner? Join the #SundaySupper conversation on twitter each Sunday. We tweet throughout the day and share recipes from all over the world. This week we will be sharing our love of Cheese, Cakes AND Cheesecakes! Our weekly chat starts at 7:00 pm EST! Follow the #SundaySupper hash tag and remember to include it in your tweets to join in the chat.Check out our #SundaySupper Pinterest board for more fabulous recipes and food photos. Join us Around the Family Table this Sunday at 7PM Eastern Time and share your favorite Cheese, Cake and Cheesecake Recipes with us! Oh, these two bite delights look wonderful!!! Styled to perfection and so delicious!!! Adorable little bites! 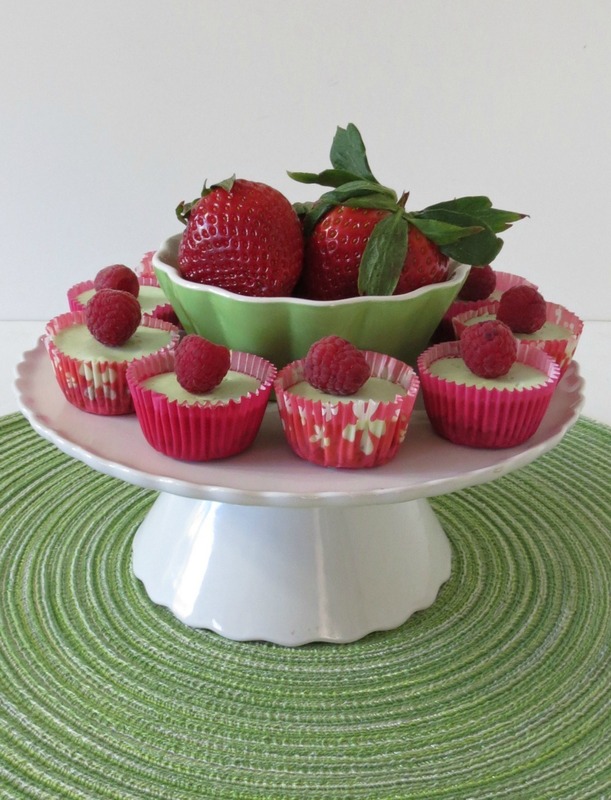 Lime with a hint of fresh raspberry on top, it´s a wonderful combination! These are my kinda cheesecake!!! And SO gorgeous! So pretty! These would be so perfect at a brunch or other similar event. I just love them! These DO look creamy and tangy…and gorgeous! How funny we both chose mini cheesecakes for sundaysupper! Great minds think alike! I joined after the foodbuzz festival, but I don’t make it every single week. Lime bites…oh yes please! Love lime! Oh, these do sound absolutely perfect for Spring! 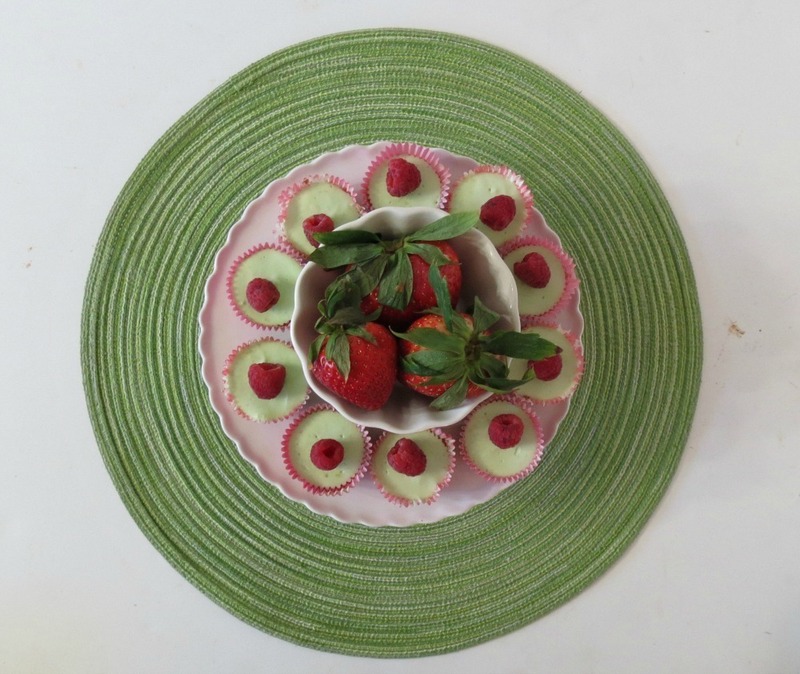 I love pink and green together, too…it reminds me of the 80’s (and preppy Izod shirts…). Yummy. Oh my gosh, your to funny! I remember those Izod preppy shirts. I loved them and my Tretorn sneakers. Looks glorious to me! Simple and flavorful – and cute~! Okay, you are killing me on these. I know I would adore them!! Aren’t these the cutest! I’m loving the flavours and the colours!! They certainly pop! Oh the fresh raspberries make it look even better. I can’t wait to try this. Thanks Laura! I thought the raspberries were so perfect with them. Loving the color combination! These are adorable! I also love pink and green together, and just can’t stop looking at these beautiful pictures! Thank you for the awesome recipe! Your sweet Diana! I love pink and green together too! These little cheesecake bites are ay-dor-ah-ble! I love the flavour and colour combinations – I can almost taste that tart lime with the tanginess of the greek yogurt and cream cheese. Perfect as we finish off winter and head towards spring. lol, I thought they were perfect for bringing in spring!! Jen, these are adorable. My husband is going to love these! Oh these look gorgeous!I love that you’ve made it healthier and I cannot wait to try it soon!!Yumm…. Oh, these are so so cute!!! I love anything with a tart citrus flavor and the addition of the raspberry looks fantastic! Squee, these are so cute. I just love the presentation. Tiny food is just so cute. Oatmeal as a base sounds like a great idea! I love citrus desserts and lime cheesecake sounds refreshing and delicious!!!! Wow, this looks AMAZING! I love these! What a fabulous idea of the oat crunch for the bottom! Delish and healthy! Hells yes! So cute and a fresh take on cheesecakes! I love these! From the top to the bottom I love everything about these little lime cheesecake bites. Great crust. Wonderful photos too. The green and pink do go so well together. These are so cute, Jen!! I love lime and mini food always tastes better! ooo I haven’t had lime cheesecake in a long, long time! These are perfect little bites! These sound so easy even I could do it! I love citrus.